This recipe, oh man. I have wrestled with this bad boy. I admit to you, I almost gave up! The first time I made it, it was perfect. A grain free focaccia with that airy softness inside, pliability and golden crust. It was magic. I jotted down the recipe and patted myself on the back and thought yep you've done it again girl, this one's a real winner! You see, at that point I didn't realize that this would be the recipe that would haunt my dreams. That's just a pinch over dramatic. I tested it three more times after that, the next week. And then after that week I lost count of how many times I tested it. It didn't seem worth it to remember anymore. And that's when I realized: oh my god this recipe is going to kill me. Why, you might ask? Well, let me tell you. It's an easy recipe in theory. But in practice, very slight tweaks give you rather variable results. I tried it with more liquid, less liquid, more leavening, less leavening. I tried it 100% vegan by subbing the egg for chia (whole, then powdered) and flax (ground). I added more almond flour, less almond flour, more tapioca flour, less tapioca flour, more oil, less oil. Some were too fluffy, others too flat. Some didn't cook through all the way and were gummy in the center. Some turned out a sad, bland, gray color. Others had the perfect look but tasted like baking soda. All of this malarky in an attempt to get back to that first, perfect, shining focaccia that made me feel all warm and fuzzy inside. I realized that I had to do the thing I didn't want to do. I had to measure the flours by weight. Finally, I figured it out. The problem was that the two main ingredients -- almond flour and tapioca flour -- can't be measured accurately with a cup-measure. This is because almond flour and tapioca flour are sometimes highly compacted or very light and fluffy right out of the bag. I also discovered that the vegan version of this lacks a depth of flavor. A good farm-fresh egg makes this focaccia both fluffy and flavorful. That healthy yolk works some magic. The vegan adjustment totally works, it's just a bit flat tasting. I suggest amping up the flavor by adding some nutritional yeast, minced garlic or fresh herbs. This is to say, my very wonderful easy awesome buttery fluffy grain free focaccia is now perfect and will totally not make you want to pull your hair out! Just make sure you use a kitchen scale to get the correct flour weights. I bet you're wondering why I even bothered with a recipe that took so long to develop, eh? Because it was worth it. As a mostly gluten-free gal with an aversion to xanthan gum, potatoes and exceedingly particular tastebuds, I have zero options for bread these days. Unless I make it myself, of course. I currently have a deep, feverish craving for something bread-like and gut-friendly. So a one-bowl, 30-minute recipe for wheat-free bread with that awesome pull-apart quality is about as dreamy as it gets. And hey to sweeten the pot I have a cashew garlic white sauce for you! It's pretty similar to an alfredo sauce. I use it as a pizza sauce, spread thickly over the focaccia base. In the pictured photos, I made my pizza with fresh spinach, chives and basil. The result: an herbaceous, cheesy, garlicky mess of pizza goodness. 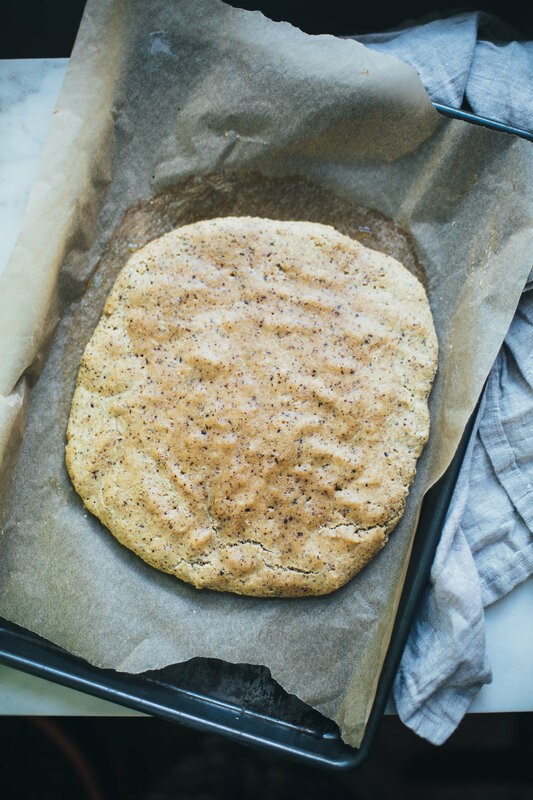 9 ingredient, one-bowl grain free focaccia bread made with almond meal, tapioca flour and flax! NOTE #1: Weighing the flours ensures an ideal outcome. Note #2: Make this vegan by subbing a chia egg. The vegan version doesn’t rise as much and is less airy and soft. Whisk together almond meal, tapioca flour, baking soda and sea salt in a large mixing bowl. Add the olive oil, apple cider vinegar, water, flax and egg to a small separate bowl. Set that bowl aside to hydrate for 15 mins. Then stir everything together to combine until saturated (it will be very sticky). Scrape the sticky dough out onto your parchment paper lined baking sheet. Wet your hands (this is important) and pat the dough into a round, flat 9” circle about 3/4” thick. If the dough sticks a lot to your hands just rewet your hands before handling again. If the top is very wet before baking (if there are divots with water in them) then pat the focaccia dry gently with a paper towel. Set the focaccia on the center rack of your oven and bake for 20 minutes, brushing the top with olive oil half-way through baking. Note: The focaccia rises about 1/2” to 1” but doesn’t spread. At the end of baking you can broil 30 seconds - 1 minute to get the top extra golden. Let cool 5 minutes before handling or slicing into it. Serve warm. Best eaten fresh on the day it’s baked. To use as a pizza crust, bake according to the above instructions. Then spread with pre-cooked toppings and sauces. Bake in the oven at 425F for 5 minutes to melt cheese / wilt greens in the oven. Serve hot. Note: in the pictured pizza, I used fresh spinach, basil and a cashew garlic white sauce. Then I served it with a sprinkle of hot chili pepper flakes and a drizzle of olive oil. This vegan cheese sauce is 7 ingredients and made entirely in a blender! In the bowl of a high powered blender, combine the cashews, garlic, 6 tablespoons warm water, coconut oil, miso paste, nutritional yeast and juice of 1/2 lemon. Blend, scraping down the sides as needed until it comes together. Add 1-2 more tablespoons of water as needed to get a smooth, spreadable consistency similar to an alfredo sauce. Use as a white pizza sauce or, generally, it makes a delicious all-purpose creamy cheese sauce.